The American Standard 0236.004.020 Pedestal Top embraces an elegant design that stands out and brings with it that sought-after sophisticated, clean, and classy look. This pedestal sink top is a pride of the Cadet Suite Collection and is hailed by consumers for its beauty and long product life. Featuring a durable Vitreous china surface, it is not just tough and unrelenting but it also offers high impact resistance to stains, scouring, and heat. Functionality and appeal - all in one place.The American Standard Bathroom Sink's white finish offers a pearly glow in your bathroom and blends well with just about any fixture and theme. Its exclusive EverClean Antimicrobial Surface makes it easy to clean and keep clean so your valuable time will not be wasted on cleaning from now on. The sink bowl gives you enough depth at 6" and the faucet ledge has a generous shelf area so splashes are lessened and hand washing is more comfortable.It comes with a rear overflow and faucet holes on 4" centers. The bowl's nominal dimensions are 24-1/2" x 20" x 35". Included in the package is a mounting kit for a fast and easy installation. More details are available in the specification sheet. 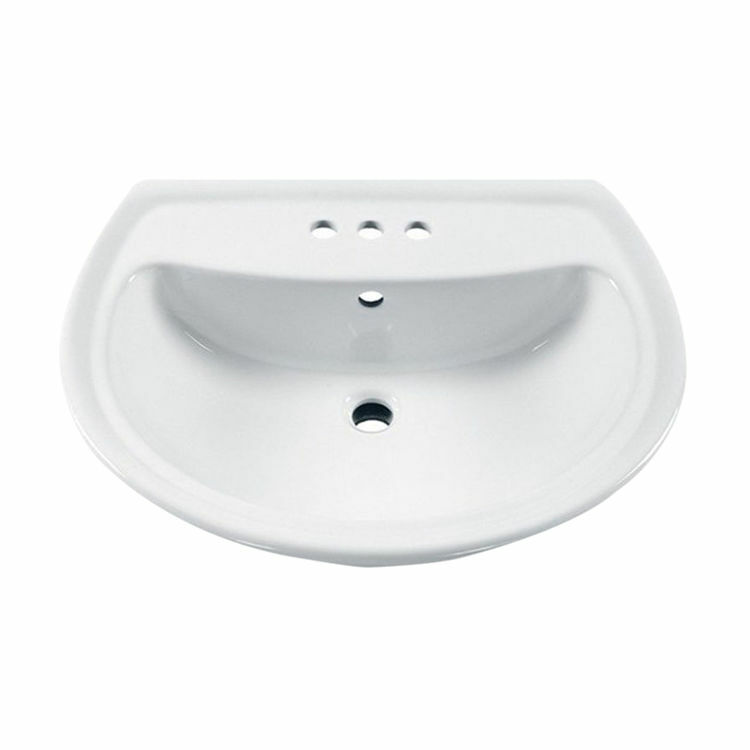 This American Standard Cadet Suite Sink comes with a soap or accessory ledge for your added convenience. It is designed to match beautifully with American Standard's Cadet Toilets. Add to this the American Standard 7311.00-400.020 White Pedestal Leg and make your lavatory a fashion-forward haven! The extraordinary blend of style and function it offers makes it an excellent choice for homeonwners around the globe. Size: 24-1/2" x 20" x 35"
Shipping Dimensions 25.3" x 21.0" x 9.9"